Scuderia Italia Laser Cut Self Adhesive Car Badge. 7". A single 'Scuderia Italia' self adhesive laser cut composite car badge. Suitable for outdoor use on cars. Laser cut to shape shown, from industry standard acrylic lasering material. Black & Brushed Aluminium style as shown. Backed with 3M automotive grade self adhesive, as used on most modern car badges of this type. Easy to apply, just peel off the backing and stick! Scuderia measures approximately 105mm by 30mm at its widest and tallest points and Italia measure approximately 70mm x 28mm. Both are approximately 1mm thick. 1 set of text supplied (1 each of Scuderia & Italia). Touring Superleggera Laser Cut Self Adhesive Car Badge. 4". Alfa Romeo Logo Style Laser Cut Self Adhesive Car Badge. 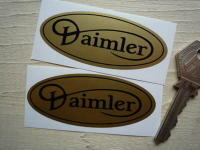 1" or 2"
Daimler Gold & Black Oval Stickers. 3" Pair. Mille Miglia Directional Stickers. 1.5", 2.5", 3.5", 4.5" or 5" Pair. Pirelli Oblong Stickers. 4", 6", 7" or 10" Pair. Scuderia Ferrari Dancing Horse Shield Stickers. 1", 2.5", 4", 5" or 6" Pair. 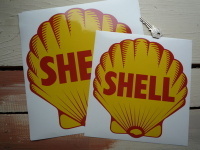 Shell Classic Logo Sticker. 8.5", 9" or 12". 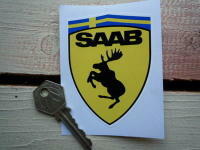 Saab Funny Ferrari Style Prancing Moose Shield Sticker. 2.5". Agip Earlier Style Tall Stickers. 2.5", 4", or 5" Pair. 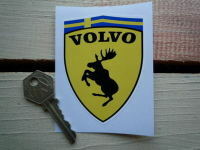 Volvo Funny Ferrari Style Prancing Moose Shield Sticker. 2.5". N.A.R.T. 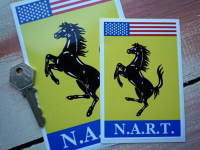 Ferrari North American Racing Team Style 1 Sticker. 4.5", 6" or 9". Alfa Romeo Cloverleaf Triangle Stickers. Colour. 1.5", 2.75", 4" or 6" Pair. Agip Later Style Tall Stickers. 2.5", 4" or 5.5" Pair. Pininfarina Laser Cut Self Adhesive Car Badges. 3", 3.5" or 5" Pair. Shell 1955 Logo Sticker. 10" or 12". Mille Miglia 1000 Flag & Scroll Sticker. 4". 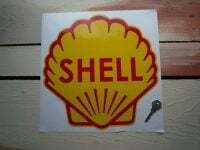 Shell V Power Only Fuel Filler Flap Sticker. 2.25". Scuderia Filipinetti Stickers. 4", 5", 7", or 8" Pair.